The "Blok" Group of Cubists, Constructivists and Suprematists was an avant-garde art group active in Warsaw through years 1924 - 1926, made up of: Henryk Berlewi, Jan Golus, Witold Kajruksztis, Katarzyna Kobro, Karol Kryński, Maria Nicz-Borowiakowa, Maria Puciatycka, Aleksander Rafałowski, Henryk Stażewski, Władysław Strzemiński, Mieczysław Szczuka, Mieczysław Szulc, Teresa Żarnowerówna. Postulates of seeking new forms and means of expression along with art reform slogans in Poland were first proclaimed by Polish Expressionists, who were renamed as the Formists. The original name of the group indicates that identifying distinctiveness of the Polish culture against the European heritage and relating to national traditions was most meaningful to the afiliated artists. The next avant-garde generation, aware of the current artistic situation in the Soviet Union as well as in the West, joined the international discussion on the role and principles of art and presented a very original stand on the subject. The experience with USSR of Władysław Strzemiński, Katarzyna Kobro and Witold Kajruksztis was very important in this situation, as well as personal contacts of Henryk Berlewi, Mieczysław Szczuka and Teresa Żarnowerówna with the Berlin art gallery "Der Sturm". The shared point of reference for the first avant-garde artists in Poland was the process of empowerment for painting as an area where only painting matters take place (this idea was launched in Polish art at the beginning of the twentieth century). Constructivists, however, alongside the issue of the construction of an objectless image, took up many new problems, concerning the use of unusual materials (including those from industrial production) and essentially the issue of placing art in a modern society. These views began to emerge in the early 20's. Strzemiński wrote in "Zwrotnica"/"Junction" (1922) that Russian art is "concise, simple, objectless and above all constructional". However, Tadeusz Peiper emphasised the organic relationship of art and society in a program-manifesto article entitled "City. Mass. Machine"/ "Miasto. Masa. Maszyna". The exhibition of three young graduates of the Warsaw Academy of Fine Arts: Mieczysław Szczuka, Henryk Stażewski and Edmund Miller, which took place in 1921, is considered one of the first displays of constructivism in Polish art. Szczuka presented compositions made out of iron, stone, glass and wires, Stażewski showed Cubist still nature and Miller made posters, where the typography was based on building compositions out of words and letters in such a way to visually emphasize the most important parts of the text. Even though this exposition already rather diverged from the previous events, the word 'constructivism' was not yet used. The opening of the "New Art Exhibition" in Vilnius by Strzemiński and Kajruksztis (1923) is considered the symbolic beginning of the Constructivist movement in Poland. For the first time, the 'construction' slogan appeared as an artistic postulate, while the innovatory character of the exhibition drew a lot of attention. A set of kitschy postcards was arranged with a collection of avant-garde publications, periodicals and books, often dedicated to the subject of art. The exposition also featured works of such artists as: Karol Kryński, Witold Kajrujksztis, Maria Puciatycka, Henryk Stażewski, Władysław Strzemiński, Mieczysław Szczuka, Teresa Żarnowerówna. It was dominated by geometric compositions, many of which were Cubist and Purist-like; however the exhibition was very diverse. In retrospect, most apparent is the exploration for principles of the new art, inspired by various directions of modern creativity. The accompanying texts on the program prepared by Szczuka were partly printed in the catalogue or entirely published in "Zwrotnica" / "Junction" and broached the problematic aspects of constructivism such as postulates of art unity and social issues. The exhibition initiated the Blok Group of Cubists, Constructivists and Suprematists/"Blok" Kubistów, Suprematystów i Konstruktywistów (1924-26). The group consisted of among others, the aforementioned artists who played a significant role in the radical avant-garde of the Polish interwar period. Together they started the Blok journal in which they published their own theoretical pieces, including texts by Kazimierz Malewicz, Filipp Tomaso Marinetti, Theo van Doesburg, Kurt Schwitters and Herwarth Walden. The creative fascination with Russian constructivism, Malewicz's supermatism and Dutch neoplasticism resulted a endeavour to seek radical forms of imaging. Another characteristic of the emerging artistic collaboration was concern for new forms of modern civilizations, defined by experience of living in the big city, in an industrialized country. Discussions were often held in Pełczyński's studio on Szczygła 10 street with the participation of Stażewski, Szczuka, Rafałkowski and Nicz-Borowiakowa. 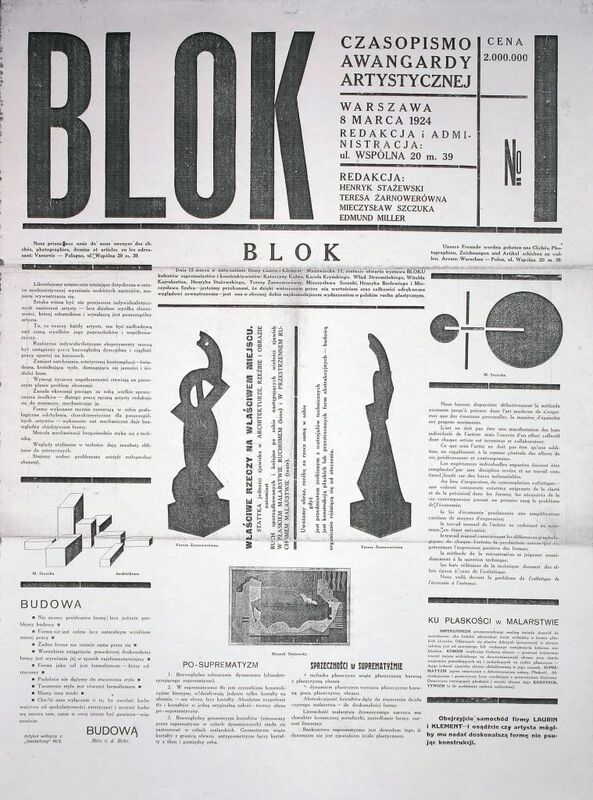 The first issue of Blok was published on March 8, 1924. A few days later there was a group exhibition held in a significant place - a Laurin-Clement car showroom in Warsaw, near Mazowiecka street. It featured the first members of Blok: Henryk Berlewi, Katarzyna Kobro, Karol Kryński, Witold Kajruksztis, Henryk Stażewski, Władysław Strzemiński, Mieczysław Szczuka, Mieczysław Szulc and Teresa Żarnowerówna. Shortly after, they were joined by Jan Golus, Maria Nicz-Borowiakowa and Aleksander Rafałowski. The first issue of the journal was probably the catalogue for the exposition. By referring to the reproduced pieces and the information about the event which presented works of "Cubists, Constructivists and Supermatists" it is assumed that it was equally eclectic as the Vilnius exhibition. Geometrical forms, schematization and simplification both in abstract and representational paintings were the common elements of the presented works. Already in thefirst year of the group's existence while it was still consolidating, there were tensions and view differences revealed which led to a breakup in 1925. Strzemiński as the first one determined himself to the current art tendencies and his deliberations were completed by Szczuka. According to them, after cubism and suprematism, the development of new art was directed toward constructivism. Strzemiński focused on pure painting qualities of this trend, such as flatness or statics and the ability to conduct a formal experiment. Szczuka, fascinated by applied arts, valued the utilitarian functions, associated with modern architecture, typography, prints or films. Another presentation of the Blok group took place at the turn of December 1924 and January 1925 during a collective exhibition of the Polish Artistic Club at Warsaw’s Polonia Hotel. However, the press reviews contained information on the participation of only Nicz-Borowiakowa, Stażewski, Szczuka and Żarnowerówna; Strzemiński and Kobro certainly were not present because of the escalating conflict with Szczuka (Berlewi left the group after the exhibition). The reviews pointed out the joint formal searches and its focus on developing the abstract art language. The central concept of the program appointed in 1924 was a construction, understood as a guideline for all of Blok's actions. Acquired from a technical vocabulary though not explicitly defined, indicated the composition's severity, the interdependence of forms and clarity of artistic expression. The paintings were to be translatable into the language of arithmetic or mechanics; other works were to based on reason, much like a machine. The category of beauty was replaced by the notion of an organic and logic form, while the creative purpose was not the aesthetic experience or contemplation, but a product designed for social use. The creator took the position of a constructor and his job was to fulfill specific functions of the social circuit. This vision assumed unity in art, work and social life. However, the postulates of utilitarianism in art were conceived in different ways by the avant-garde artists. Their stances were quickly polarized leading to a breakup in the constructivism environment in 1924. The theoretical texts published in "Blok" proved so (Mieczysław Szczuka's "What is Constructivism? ", a lecture on the theory of Unism and Władysław Strzemiński's "B=2", an introductory to formulating the Unism theory). Strzemiński, working with Katarzyna Kobro and Henryk Stażewski was a spokesman for art autonomy and freedom in artistic exploration. He believed that artists are entitled to "laboratorial cleanliness" in the field of artistic experimentation which at the creative state should not be subordinated to the demands of social utility. He postulated the necessity of combining art and social life, considering art to be the primary domain. It was to form all the human doings, actively influence on processes taking place in the modern world. Mieczysław Szczuka, as per the extreme leftist ideas perceived the methods of creative work in a completely different way, rather to put it in a category of productive labor. Strzemiński thought that this was an instrumentalisation of art, that Szczuka appointed its subordinate role in the society, forcing the evaluation criterion to assess the possibility of new solutions based on purely utilitarian purposes: designing industrial forms, interior design, typography and fashion. In 1925, the group broke up. The only issue of the magazine which appeared at that time was entirely devoted to architecture and theatre. The subjects of easel and "clean" paintings have been abandoned. Szczuka and Żarnowerówna were the only painters to stay in Blok. The focus was set on industrial, advertising, theatrical and above all architectural design, which was reflected in February 1926 at a joint International Exhibition of Modern Art at the Zachęta National Art Gallery - the last issue of Blok was entirely devoted to this event.